[ British Army in India, Presidency District Assault-at-Arms, Calcutta Race Course, February 1904. ] Printed programme with list of events, judges and prizes. The collection is of great interest, providing a mass of information regarding the Victorian building trade. The owner of the volume, W. H. Dudley, would appear to be a War Office official, and, as described at the end of this entry, it contains manuscript details of two contracts. The ten printed schedules - totalling [34 + 17 + 14 + 10 + 12 + 13 + 12 + 10 + 16 + 11 =] 149 pp., folio - are uniform in design and format, bound together in a contemporary half-binding, with brown leather spine and corners, and marbled boards. All ten are in good condition, on lightly-aged paper, in worn binding. 1p., folio. An unusual production, containing 78 numbered items in two columns, with illustrations, lithographed to look like a manuscript in tight, neat handwriting. In fair overall condition, on aged paper, with a triangular hole with 5 cm edges and minor damage sympathetically repaired with archival tape. The books range from 'No. 1. Eugene Aram's Trial, Life, Letters, Poems, &c. 12mo. 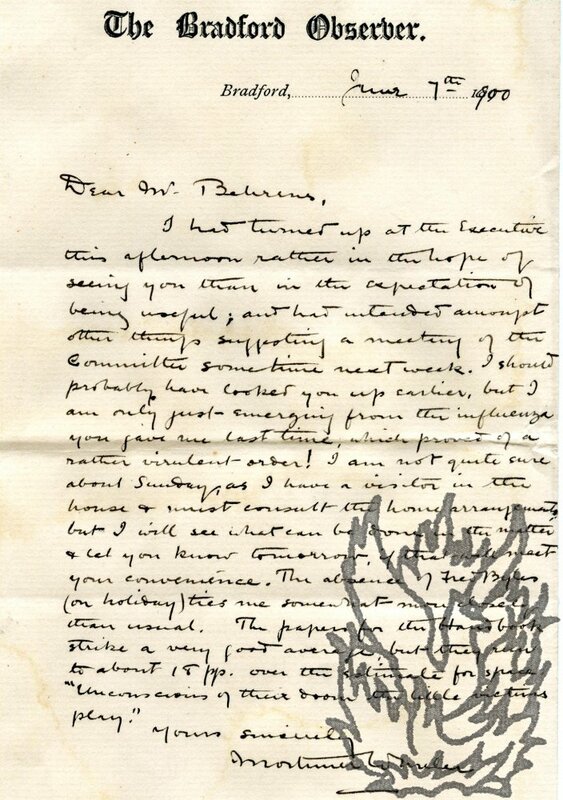 Facsimile Letter. 1/2 cloth, scarce s4/ Richmond, 1832' to '78. The Stowe Catalogue Priced & Annotated by H. R, Forster. Sm. 4to cloth leather back. [ The Excelsior Cinema, Cuddapah, India. ] English and Telugu handbill for 'A Grand Show of an Assembly of Nation Builders of India & England', 'Under the kind patranage [sic] of A. G. Blake Esq., I.C.S. ', including a film by Kohinoor Film Company. The Excelsior Cinema, Cuddapah [India]. From 10 May 1931. Printed on one side of a piece of 29 x 22.5 cm yellow newspaper stock. 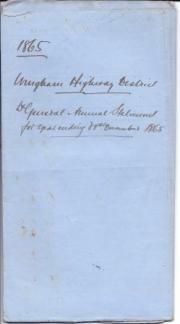 In fair condition, on aged and worn paper, with a 1 cm closed tear to the margin. Distinctively laid out, within a decorative border, with three vignette silhouettes of men in evening dress. Under the heading 'Double attraction', announces that 'The Excelsior Cinema Cuddapah. | Takes Pride in Presenting from Sunday 10-5-31. 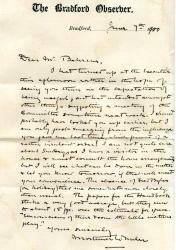 | Under the kind patranage [sic] of | A. G. Blake Esq., I.C.S., | Collector and District Magistrate, Cuddapah. | A Grand Show of an Assembly of | Nation Builders of India & England. Typed and signed 'Contract for the supply of a Motor Ambulance and accessories' between 'The Vulcan Motors (London) Ltd & The Urban District Council of Chiswick'. With three blueprints and two sets of specifications. Six items stitched together with green ribbon. Heavily aged and with extensive damp damage. ONE: Typed agreement between The Vulcan Motors (London) Limited and The Urban Distric Council of Chiswick, dated 12 September 1923, signed by the directors of Vulcan Motors and their secretary. 2pp., folio. TWO: Typed 'Specification of Ambulance Body to be securely attached in an approved manner to Vulcan One Ton Chasis. As shown on the blue print attached.' By 'Engineer's Dept., Town Hall, Chiswick.' Dated 1 May 1923. 2pp., 8vo. [Printed document.] Motor Cars. Memorandum of the Cheltenham Rural District Council to the President of the Local Government Board, With reference to the recent Report of the Royal Commission on Motor Cars. 2pp., folio. Bifolium. In small type. Containing two copies of a printed circular by McIlquham, on Cheltenham Rural District Council letterhead, dated 14 September 1906. In good condition, lightly aged and worn. The memorandum is divided into five sections, and begins by putting the Council's position that 'Motor Cars travelling at high speed in dry weather along the unwatered roads of country districts occasion an intolerable dust nuisance to other users of the highway, and seriously prejudice the comfort and even the health of the inhabitants of road-side dwellings'. [10 printed items] Schedule of Contract for Carpenters' [Bricklayers'; Slaters'; Plasterers'; Plumbers'; Painters'; Glaziers'; Smiths'; Cast-iron and Metal] Work for the Service of the War Department, at [blank] in the South-west and Sussex District. File of 78 documents from the papers of the jurist and Labour politician Professor R. S. T. Chorley [later Lord Chorley], relating to his campaign against the building of a 'road house' at the Old Brewery Stables, Great Stanmore. As Chorley is described in his entry in the Oxford DNB as a 'conservationist' with a 'deep attachment to and lifelong concern for the English countryside', it is a surprise that no mention is made of the matter to which this collection relates, which created some public interest at the time and involved a landmark legal action. The first item in this collection - a copy of typed letter from Chorley to the Clerk to the Hendon Rural District Council on 24 October 1932 - sets the scene neatly. Autograph Note Signed "William T. Palmer", The Fell & Rock Climbing Club, to a "Mr Smith", about the 'Journal'. [Printed heading, "The Fell & Rock Climbing Club ", etc., Beechwood, Kendal, 22 Dec. 1916. One pager, fold marks, minor defects not affecting text. "Dear Mr. Smith, | The 'Journal' is in preparation, but will be greatly delayed this year. I will notify you later. | Yours faithfully, | William T. Palmer | Editor". Holograph poem by the Harvard-educated lawyer George Stillman Hillard, Attorney General of Massachusetts, titled 'To the Friday Club'. With engraved portrait of Hillard. 3pp., 12mo. A fair copy. Very good, on lightly-aged paper. The twenty-eight-line poem is arranged in seven four-line stanzas, with Hillard's firm signature and the date at the end. The poem begins with unintentional, but no less curious, sexual overtones: 'The rod of Aaron, severed long | From its ancestral bowers, | Felt in its veins the sap of youth, | And shone with buds of flowers. | The rigid staff, smoothworn and dry, | In living green was dressed. Autograph Letter Signed ('Geo. S. Hillard') from George Stillman Hillard (later District Attorney for Massachusetts) to the abolitionist Rev. Samuel Joseph May, describing his acquaintance with the first Harvard Professor of German, Charles Follen. 4pp., 4to. Bifolium. 89 lines of text. Good, on lightly-aged paper. Addressed, with red circular postmark, on reverse of second leaf, to 'Revd. Samuel J. May | South Scituate'. Hillard describes 'Dr. Follen' as 'an intimate and dear friend to me'. He looks back 'with melancholy pleasure upon the happy hours' he spent in the society of 'so pure and elevated a being'. He has 'never known a better man; I do not know that I may not say, that I have never known so good a man. Victorian parish financial accounts relating to Wingham Highways District, Kent, comprising ten General Annual Statements [1863, 1865 to 1873], a Statement of Receipts and Expenditure , and a Financial Statement, 1879. 1863 to 1879; Wingham, Kent. The twelve items are in fair condition, on lightly-aged paper, folded into packets, with all texts clear and complete. The first of the General Annual Statements, that for '1863 & 64', is representative. Its two pages are on one side each of two landscape sheets of grey paper, both 67 x 42 cm. Both are printed forms, with columns in red, headed '25th & 26th of Victoria, Cap. 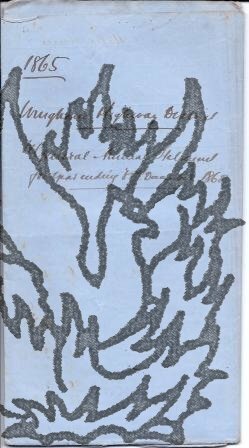 61 GENERAL STATEMENTS of RECEIPTS and EXPENDITURE on Account of the HIGHWAYS of each Parish, Township &c.
Autograph Notes relating to the London district of Fulham. Undated; on three letterheads of 'Frognall End, Hampstead, N.W.' [London]. The notes, on three 12mo bifoliums, cover three pages, with a few lines on a couple of others. In excess of eighty lines. Very good. Brief chronology and list of notable residents, presumably an outline for the description of the district in Besant's 'London' (1892) or another of his many writings on the city. Advertisement for 'Dorking Urban District Book, Waste Paper and Cardboard Drive'. 12th April to 1st May 1948. Striking advertisement, in red ink, on one side of a piece of paper roughly seven inches by seventeen wide. With something of a prewar feel, it reads 'DORKING URBAN DISTRICT | BOOK, WASTE PAPER | and CARDBOARD DRIVE | [in box on right] 12th April | TO | 1st May | 1948 [end of boxed text] | Save the Nation from having to import Waste Paper from abroad | PROVIDE | MORE Employment = MORE Cartons for Food | = MORE Materials for Housebuilding ='.